The three CEOs agreed that strengthening and evolving Arizona’s health care system requires collaboration. Valley CEOs (LtoR) Hugh Lytle of Equality Health, Todd LaPorte of HonorHealth and Nancy Ham of WebPT. Leaders Nancy Ham, CEO of WebPT, Todd LaPorte, CEO of HonorHealth and Hugh Lytle, founder and CEO of Equality Health, shared insights into the advantages of doing business in Arizona, attracting and retaining talent and how their industry is evolving with business and community leaders during the Greater Phoenix Chamber of Commerce Premier Leadership Series event Priorities & Perspectives from New Valley Leaders on June 22. 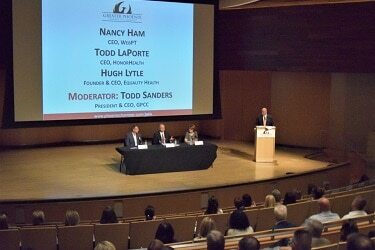 The informative event, held at the Musical Instrument Museum and sponsored by Bank of America, APS and Quarles & Brady, LLP, featured ideas and insights from CEOs who are new to their companies, new to their roles, new to Arizona or a mix of all three. The three CEOs agreed that strengthening and evolving Arizona’s health care system requires organizations to work together. “There’s a real coming together that’s going to be necessary in our health care system; much stronger collaboration and a defragmentation of the ecosystem for it to deliver what you all want it to deliver,” LaPorte said. Lytle, whose company focuses on increasing access to care for underserved populations, says Arizona is a great place to do business because of access to clients his company serves and an innovation/education culture. “We have a great base of innovation and entrepreneurship in this Valley, and strong primary and secondary education systems that, while they always need improvement, when you add the community colleges into it, make for successful workforce development, especially for health services companies like ours,” Lytle said. LaPorte adds that HonorHealth is transforming based on the health care marketplace, which is increasingly looking to hospital systems to be a solution to much broader health care issues and increasing their influence beyond their doors. WebPT’s Ham, who provides software to the health care industry and individual physicians, said attracting and retaining top talent at WebPT is a constant battle for her and many Arizona employers, including those on the panel. The key to competing against ever-increasing salary offers is creating and maintaining great culture. All three CEOs agreed the health care industry of the future will be increasingly consumer-focused and consumer-driven. Attracting and retaining talent is also a challenge for hospital companies including HonorHealth, especially considering the number of Baby Boomers who need and will need health care services soon versus the number of people being trained for these careers. To help meet its ongoing workforce needs, HonorHealth provides a robust tuition reimbursement program to not only encourage employees to continue their professional development, but to also grow the economy by creating successful professionals who support businesses in their communities.